Not really, of course. The big white room is just a handy metaphor for Katy's mental anguish in her new single, Still (it's a ballad). 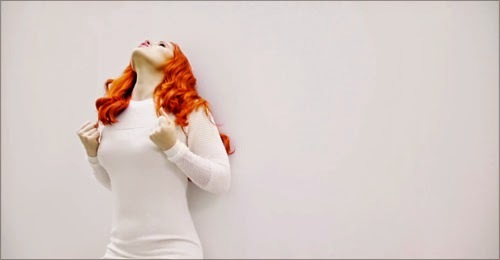 The setting also makes her shocking red barnet the only splash of colour in an otherwise monochrome video. It's like Schindler's List, but without the Nazi death camps. PS: Does anyone think Katy might have had to spend time in an asylum after the terrifying scenario depicted in the 5am video? No? Just me, then.